Today is my 265th out of the 365 total blog posts that I will be writing documenting my year without a scale and my journey to recovery, meaning today is the official count down to the last 100 days of this blog. More than anything, today is a day of reflection for me. I still remember celebrating my 100 day milestone. I remember writing that blog post. I remember the cake I ate and I remember the family I ate it with. It was significant of me truly starting this journey, and knowing that if I reached 100 days without my scale and of recovery, that I could go all the way for an entire year. 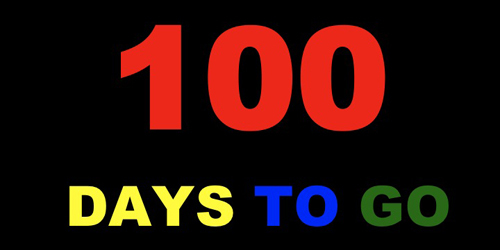 I don’t know how I am sitting here 165 days later, now entering the last closing phase of this blog, now not celebrating 100 days in, but actually celebrating 100 days left. I know, from the deepest place within me, that I could not sit here and write today’s post if I had to do this journey by myself. Thank you to all my family, my friends, my readers, my followers, my supporters, and E, for being my strength during these 8 months. Of course, this does not mean in 100 days that I will take back my scale; it’s actually the opposite of that. Giving up my scale meant making a decision. It meant choosing that I needed to re-learn who I was without that number. It meant choosing to learn how to completely re-live my life, and re-discover who I was without my eating disorder and without my weight to define me. Reaching that one year mark in 100 days will be the ultimate prize to myself that no number on a scale could ever give me; it will mean I have stuck to my decision; it will mean that I will have fought my way through this journey-through the tears, through the physical pain, and through the fear, because I told myself I wouldn’t turn back, and it will mean that I am one step closer to freedom. Will I be completely free of Ed by the time that 365th day comes in a little over 3 months? I really don’t know. Had I asked myself that question 8 months ago, I would have said yes in a heartbeat. But if there’s one thing that I’ve learned so far in recovery, it’s this: my journey is not about setting black and white goals and expecting myself to reach them; it’s not about saying goodbye to Ed forever. It’s about growing. It’s about learning. It’s about walking, dancing, turning and gliding through this process of creating a new life for myself; it’s not about reaching some certain specific goal. When I had my eating disorder, every day was about reaching some number on a scale; my life is not like that anymore. I am more dedicated to growing and journeying through my fight with Ed, through my struggles, through my pain, and through my insecurities. Lastly, I am not sure if I will ever be forever done with Ed. I used to think recovery meant totally killing Ed, or crushing Ed, or suffocating Ed. But the more I grow in recovery, the more I see that again, Ed is not black and white-and I will not hold myself to this expectation of either getting rid of him completely or living with him completely, because that’s how I got so sucked into him in the first place. “If I can’t get rid of this eating disorder, I guess I’ll give it all I got,” I used to think. I am learning to navigate my life on my terms, and walk in the path of freedom, not in the path of numbers and restrictions. But I am also learning that Ed might come and he might go, and it might be like that forever. He is a part of me. We all have people or characteristics or flaws that are a part of us that are not always good. But we learn to become stronger than them; we learn to conquer them, and we learn to rise above them–we don’t always have the option of expelling them out of our lives. So, my point is, looking back on 265 days ago, I am not that black and white person I used to be. I am not even gray. I actually don’t even know who I am yet, and I am actually excited to continue to find that out. For today, I am a 22 year old girl, counting down the days to my birthday this Friday (first birthday in recovery), choosing what I will wear, and I am celebrating being a person, just like you or someone else, who made a decision to fight for a better life, and actually stuck with it. I am celebrating walking the road that is taken by few, yet wanted and desired by so many; the road to finding true self acceptance, happiness, and freedom. Hello to the last 100 days of this blog and hello life.